We are an international coalition of courageous, committed, optimistic business leaders. We believe that the best hope for long-term peace in historically violent communities is more jobs and the economic empowerment of women. The Business Council for Peace (Bpeace) offers 5-star volunteer opportunities for Skillanthropists who advise international business owners and job creators. For those on both sides, the impact of the work they do together is measurable. 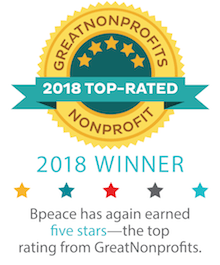 The Bpeace model unites high-quality business consulting by volunteers (“Skillanthropists") with proven and promising local job creators ("Fast Runners") to help them break through the barriers to growth and job creation. We can document the impact. Businesses that work with Bpeace Skillanthropists perform better than their local economies—averaging 20% job growth and 20% revenue growth even in countries where the GDP growth is less than 3%. These jobs stabilize families and communities, cutting the oxygen to violence and migration. When Dalia (left) launched InHouse Print in El Salvador, her offset and digital printing services were in high demand. Then she reached a plateau. Enter Bpeace. We diagnosed Dalia’s growth barriers and matched her with three Skillanthropists. Angela Scalpello (right) worked with Dalia to develop and implement an HR program that raised expectations for employees, while still maintaining Dalia’s commitment to “nice” in the workplace. Two other Skillanthropists helped Dalia develop a sales strategy and fine-tune her production processes. Today, Dalia has grown the number of employees by 107%, improved quality, and increased production capacity by 300%. And InHouse Print is still a “nice” place to work. As a chef, Mariela Saravia (in white coat) had a dream to delight people with tasty food. After a few twists and turns in her career, she began producing artisan chips. Mariela asked Bpeace to find her a volunteer expert to review her production processes and identify opportunities to achieve improvements in costs, quality, delivery and waste reduction. We matched her with Isabel Echeverria, a San Francisco-based Six Sigma Black Belt and Scrum Master. Today, Mariela provides employment for 15 Guatemalans, mostly women. The multiplier effect of her branded sweet potato, taro, cassava, malanga and plantains chips extends to rural areas. Luachips is now a bridge between responsible farmers and Mariela’s customers seeking a delicious, natural and healthy gourmet snack. In collaboration with Endeavor Lebanon, Bpeace is advising Lebanese businesses, providing tailored consulting to scale and accelerate innovation, growth and job creation. These entrepreneurs are transforming their communities, creating quality jobs in Lebanon, and inspiring future generations of founders. With Dutch NGO SPARK, Bpeace is mentoring nearly 20 young women, the majority of whom are Syrian refugees attending college on scholarship in Lebanon. The large influx of Syrian refugees escaping violence has increased the workforce in Lebanon by approximately 50%, resulting in unemployment rates reaching 20% among Lebanese and refugees alike. Even as Guatemala begins to stabilize, violence and extortion by gangs are still key issues. Gang-related violence is an important factor prompting people, including unaccompanied youth, to leave the country. The portfolio of businesses our Skillanthropists advise is concentrated in the food processing, technology, manufacturing and services industries. El Salvador remains one of the deadliest countries in the world outside war zones. Turf wars between gangs drive violence and perpetuate inequality and insecurity. In partnership with USAID, Bpeace Skillanthropists are advising significant job creators in the following sectors: technology, pharmaceuticals, medical, construction, and warehousing and logistics services. In our regions of focus, we identify business owners motivated to create jobs. For each local business, Bpeace staff conducts a position analysis that includes a strategic framework and growth priorities. We recruit volunteer experts with specific knowledge and skills, or U.S. Host Companies in targeted industries. With defined scopes of work, volunteers advise businesses remotely or by traveling. The intended outcome is more sustainable local businesses, generating increased community employment. Jobs boost family purchasing, which lifts other businesses, increases community prosperity and lessens violence. Bpeace is one impressive force for change. Are you ready to share your skills, inspire and be inspired?